the cutest thing ever is when a 2 year old asks you - in all seriousness - if he can do his school work. try not to giggle. it is so adorable. my 2 year old has started doing this lately and i'll tell you why...he loves Baby Einstein. Baby Einstein is his "school work." and the new Wild Animal Safari Discovery Kit is a great "curriculum," covering Art, Music, Nature, and Language. 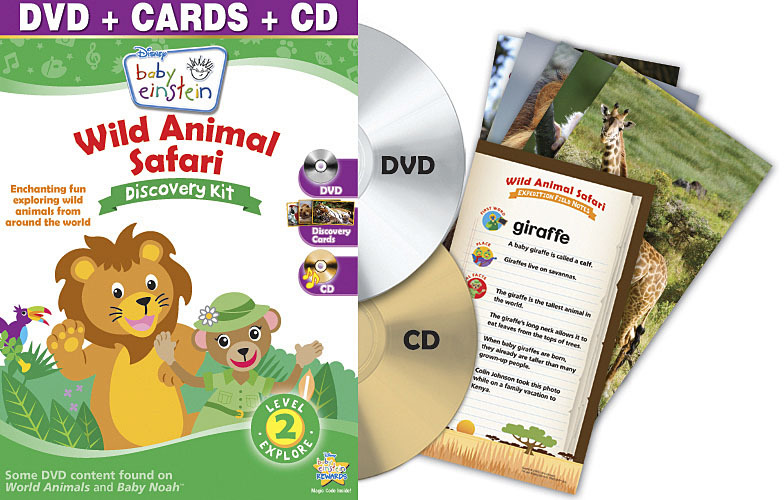 the new Baby Einstein Discovery Kit comes with a 25-minute DVD, a music CD, and 10 flash cards depicting the animals on the DVD. the music CD has the same songs played in the DVD, too. there are different levels of kits- specifically designed for your little one's developmental stages. the kit includes a Parents' Guide and helpful suggestions for the "Expedition Leaders" (that's me). really, they thought of everything. we are not big TV watchers, but i made the exception for the Baby Einstein DVD because i'm familiar with their peaceful music. it caught Bubba's attention right away, which is saying a lot since he barely ever sits still for anything. he just loved the silly puppets, and footage of real animals in their natural habitats. i read the animal facts on the back of the card. he repeats the animal's name several times. he tells me what the animals are doing in the movie- eating, running, swimming, flying. and sometimes he'll run around the room acting like a particular animal. my favorite is his elephant impersonation. later that same day, we listened to the Baby Einstein Discovery Kit CD in the car. it was peaceful. he fell asleep. mama was happy. the next day, Bubba said "Mommy, i need to do my school work!" i giggled...not quite sure what he was talking about. and then he pointed to the shelf where i stacked the Discovery Kit flash cards. "school work! i need it!" he insisted. you can buy it now on Amazon for about $13. well worth the price if you ask me. i think it would make a really nice Baby Shower gift or stocking stuffer! 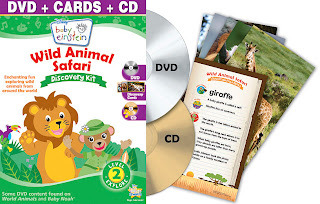 you can win a Baby Einstein Wild Animal Safari Discovery Kit! all you have to do to enter to win is leave a comment. extra entries? tweet about the giveaway (@mamahall), Facebook it, and/or post about it on your blog. just be sure to leave a comment letting me know. don't forget to include your email address! i will use Random.org to select a winner on Friday 12/17 10AM CST. this giveaway is open to US residents only, please. full disclosure: I received this free Discovery Kit through a LBi/ Baby Einstein program. All thoughts and opinions expressed are my own and no monetary compensation took place.